TREATED WOOD SHEDS OFFER A GREAT NATURAL LOOK WITH A RUSTIC VIBE. 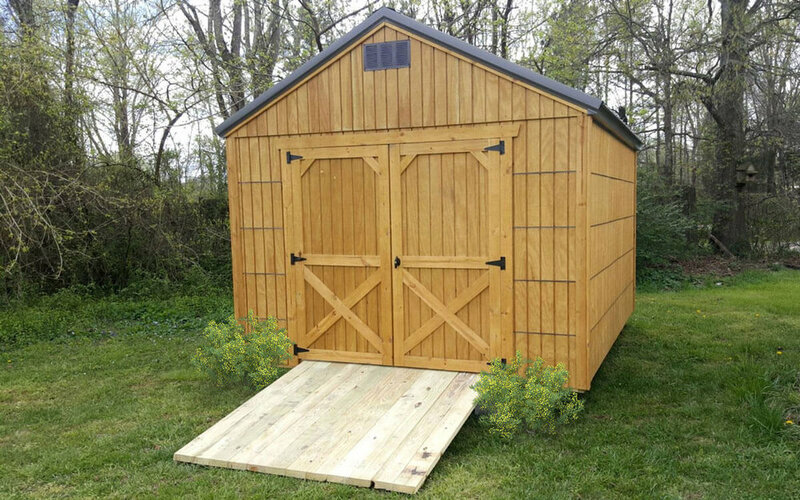 Our treated wood sheds are a solid, traditional choice for those wanting that classic wood shed look and feel. Helping to create that signature look, we treat each building with an all-natural wood stain. The stain acts in the place of natural saps and preserves and protects natural surfaces, giving the wood a longer life and finish! The classic a-frame design of the utility sheds fits perfectly into almost any landscape. Design your shed with the doors on the end or the sides. Customize your shed by adding options such as windows, shelves and high walls. When you’ve got lots of equipment or gear to store, the spacious Lofted Barn is a great choice. You will have plenty of room in the overhead lofts for items like fishing rods and storage bins. Two 4-foot lofts come standard with sheds 16 feet and longer. One 4-foot loft comes standard with sheds up to 12 feet long. 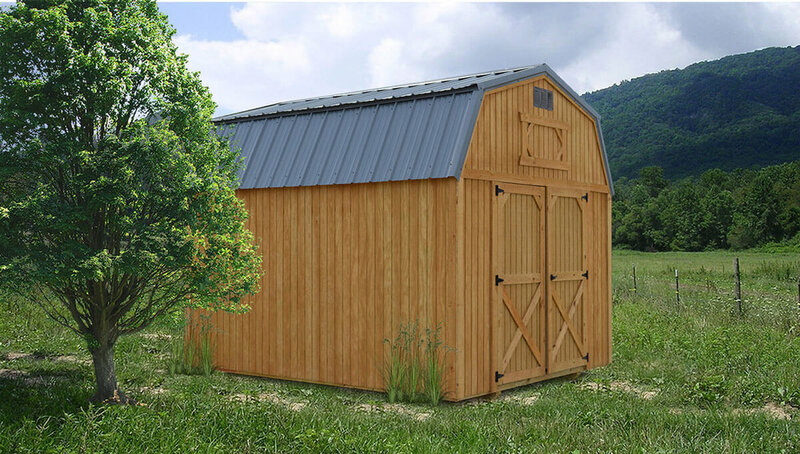 For an economical option, consider the Value Series A-Frame Shed. Crafted with smaller T-1-11 planks, and with slightly more space between the wall studs, we are able to offer this building at a reduced rate so you can keep a little extra money in your pocket! The treated wood value series sheds can be purchased when displayed at a sales lot. They are not eligible for custom orders. Why Choose A Treated Wood Shed? Treated wood sheds blend into many natural environments, making it a great choice for rural areas. The classic look of treated wood is a favorite of many. To keep the treated wood looking fresh, the shed should be re-stained once a year. Design A Shed For Your Life! Maximize its usefulness by adding one of our custom packages to create a garage, fishing cabin, or tool shed of your dreams! One 4' wide loft on buildings up to 12' in length; Two 4' wide lofts on buildings 16' in length and longer. Value Series exception has 2x4 wall studs placed 48" on center.